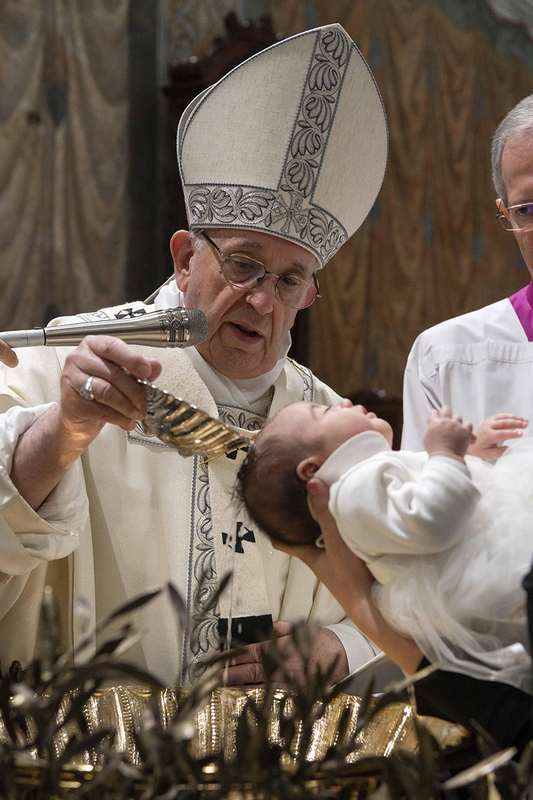 Pope Francis baptized one of 27 babies at Mass on the feast of the Baptism of the Lord in the Sistine Chapel Jan. 13. Today’s catechesis refers to the Gospel of Luke. In fact, it is especially this Gospel, beginning with the childhood narratives, which describe the figure of Christ in an atmosphere dense with prayer. In it are the contents of three hymns which each day articulate the Church’s prayer: the Benedictus, the Magnificat and the Nunc Dimittis. And we are moving forward in this catechesis on the ‘Our Father’; we see Jesus as a prayerful man. Jesus prays. In Luke’s narrative, for example, the episode of the Transfiguration springs from a moment of prayer. It says this: “And as He was praying, the appearance of His countenance was altered, and His raiment became dazzling white” (9:29). But each step in Jesus’ life is as if gently propelled by the breath of the Holy Spirit who guides Him in every action. Jesus prays in the baptism on the Jordan; He dialogues with the Father before taking the most important decisions; He often withdraws in solitude to pray; He intercedes for Peter who will soon deny Him. He says: “Simon, Simon, behold, Satan demanded to have you, that he might sift you like wheat, but I have prayed for you that your faith may not fail” (22:31-32). This is comforting: to know that Jesus prays for us, prays for me, for each one of us so that our faith will not fail. And this is true. “But Father, does He still do so?” He still does so before the Father. Jesus prays for me. Each one of us can say so. And we can also say to Jesus: “You are praying for me; continue to pray because I am in need of it.” In this way: courageous. Even the Messiah’s death is immersed in a climate of prayer, such that the hours of the Passion seem characterized by a surprising calm: Jesus consoles the women, prays for His crucifiers, promises heaven to the good thief and He breathes His last breath, saying: “Father, into thy hands I commit my spirit!” (23:46). Jesus’ prayer seems to allay the most violent emotions, the desire for vendetta and revenge; it reconciles man with his fierce enemy, reconciles man with this enemy, which is death. This request, “Lord, teach us to pray,” generates a rather lengthy lesson, through which Jesus explains to His followers with which words and which sentiments they must address God. In this teaching that Jesus gives His disciples, it is interesting to pause on a few instructions that crown the text of the prayer. To give us confidence, Jesus explains several things. These focus on the attitudes of the believer who prays. For example, there is the parable of the importunate friend who goes to disturb an entire family that is sleeping, because a person suddenly arrived from a journey and he has no bread to offer him. What does Jesus say to this man who knocks on the door and wakes his friend? : “I tell you” — Jesus explains — “though he will not get up and give him anything because he is his friend, yet because of his importunity he will rise and give him whatever he needs” (11:8). With this, He wants to teach us to pray and to persevere in prayer. And immediately afterward He gives the example of a father who has a hungry son. All of you, fathers and grandfathers who are here: When a son or grandson asks for something, is hungry, and asks and asks, then cries, shouts that he’s hungry: “What father among you, if his son asks for a fish, will instead of a fish give him a serpent … ?” (v. 11). And all of you have experienced this: When the son asks, you give him what he wants to eat for his own good. With these words Jesus makes it understood that God always responds, that no prayer will remain unheard; why? Because He is Father, and does not forget His suffering children. Of course, these affirmations disconcert us, because many of our prayers seem not to obtain any results. How often have we asked and not received — we have all experienced this — how many times have we knocked and found a closed door? Jesus advises us, in those moments, to persist and to not give up. Prayer always transforms reality, always. If things around us do not change, at least we change; our heart changes. Jesus promised the gift of the Holy Spirit to each man and to each woman who prays. We can be certain that God will respond. The only uncertainty is due to time, but let us not doubt that He will respond. Perhaps we will have to persist for our whole life, but He will respond. He promised us this: He is not like a father who gives a serpent instead of a fish. There is nothing more certain: The desire for happiness which we all carry in our heart will one day be fulfilled. Jesus asks: “Will God not vindicate His elect, who cry to Him day and night?” (Luke 18:7). Yes, He will mete out justice; He will hear us. What a day of glory and resurrection that day will be! Henceforth, praying is victory over solitude and desperation. Praying. Prayer transforms reality; let us not forget this. It either changes things or changes our heart, but it always transforms. Henceforth, praying is victory over solitude and desperation. It is like seeing every fragment of creation teeming amid the listlessness of a history whose meaning we sometimes fail to grasp. But it is in motion, it is on a journey, and at the end of every road, what is there at the end of our road? At the end of prayer, at the end of the time in which we are praying, at life’s end: What is there? There is a Father who awaits everything and everyone with arms wide open. Let us look to this Father.